Here is the finalised DNA Lecture schedule for Genetic Genealogy Ireland 2015. You can also find it on the Back to Our Past website here. There's only 3 weeks to go before we launch into the third year of DNA Lectures at Back to Our Past. There are several changes to this year's event that make it different from previous years. First of all, the event is a week earlier in the calendar than usual. 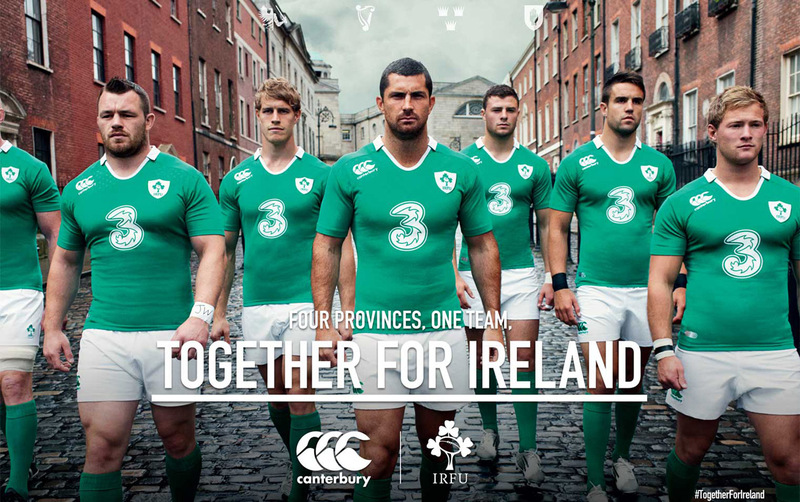 This is to accommodate the quarter finals of the Rugby World Cup because there is a real chance that Ireland will be in the quarter finals. As a result Back to Our Past will take place on Friday to Sunday October 9th to 11th. This year the event moves to a different hall within the RDS complex. The new venue, the Serpentine Hall, is now entirely dedicated to genealogy. Previously we shared the hall with the Over 50's Show and the Coin & Stamp Fair, and while they will still be around, this year we have an entire hall devoted to genealogy. You can see the floorpan below. 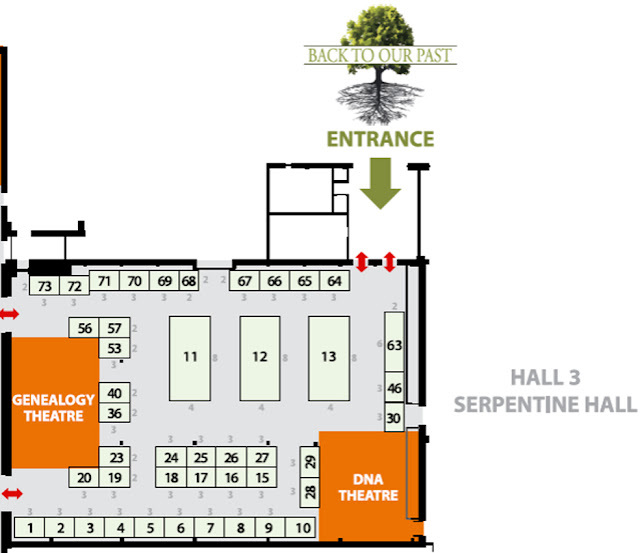 FamilyTreeDNA are once again kindly sponsoring the DNA Lectures and they will have a stand at the event, this year all along the North wall of the hall. This gives us a lot more display room than previously and we will be having a poster display area highlighting the work of Project Administrators, made possible by the wonderful infrastructure tat FamilyTreeDNA have created for us. So if you have a poster about your project, get it to us before October 9th and we will put it up for you (space permitting). Last year's event was a great success and videos of many of the presentations have been viewed on the dedicated GGI YouTube Channel by almost 9000 people for about 100,000 minutes (that's over 67 days). So this 3-day event has already left quite a legacy. Once again, as many as the lectures as possible will be uploaded to the GGI YouTube Channel and made available for free to the international genetic genealogy community. There aren't many genetic genealogy conferences and having the YouTube Channel ensures that the value of the GGI2015 presentations travels much further than the actual conference itself. And here is the schedule. Wishing everyone a fabulous time at GGI2015 and Back to Our Past! Y-DNA traces your father's father's father's line, mitochondrial DNA traces your mother's mother's mother's line, and autosomal DNA traces everything in between. With the help of practical examples of how DNA solved mysteries related to the Spearin family of Limerick, the bones of Richard III, and a Wedding Memento from the Australian desert, you can decide which test is best suited to solve your own individual genealogical conundrums. Maurice is a psychiatrist, a pharmaceutical physician, & a genetic genealogist. He did his first DNA test in 2008 and since then has used DNA to good effect in his own family tree research. He is now Project Administrator for the Spearin, Farrell, and Gleason Surname Projects and runs several special interest projects. Maurice organises Genetic Genealogy Ireland and speaks about DNA and genealogy at international and national meetings. Are you considering an autosomal DNA test or have you tested and are wondering how it can help your genealogy research? The atDNA test is the most exciting and popular test as both males and females can match, and it covers multiple lines of your pedigree chart. Understand how atDNA is inherited, including the X-chromosome which differs for each gender. Learn how to obtain maximum results from your test. Discover how to find common ancestors you share with matches. A handout is available. Emily's book Genetic Genealogy: The Basics and Beyond is for sale. Free draw for the e-book version during her presentation for two winners. Emily, a retired teacher with a Master's degree and an avid genealogist since 1970, travels nationally and internationally for her family research and to speak on genetic genealogy. She has been interviewed in various newspapers, on blog radio programs, on local television, teaches classes on writing childhood memories and family stories, writes two blogs, and has the Ogan one-name study. She recently published a book on genetic genealogy for beginners entitled Genetic Genealogy: The Basics and Beyond which is available at the conference. This lecture will discuss the different regimes of DNA testing (paternity, CODIS, MtDNA, Y-STR, Y-SNP, medical genes, etc.) and how they are reported or misreported in the news. This talk will help you understand the application of each type of DNA test, of which genetic genealogy is just one application. As a boy in the 1970s I was inspired by watching Alex Haley's television series, "Roots". I thought, "If Alex Haley can do it, why can't I do it too?" I am now editor of the SurnameDNA Journal, founder of GeneticHomeland.com, a DNA Project Administrator, and a member of ISOGG and the Southern Californian Genealogical Society. The lecture will use Prof Mallory's book The Origins of the Irish as a springboard for examining the possible ways that archaeologists might identify the arrival of Celtic-speakers in Ireland and the formation of an Irish ethnic identity. Professor of Prehistoric Archaeology (Emeritus) at Queen's University Belfast specializing in Irish prehistory, the archaeology of the Eurasian steppe, and the integration of linguistic and archaeological evidence. He is the author of The Origins of the Irish, In Search of the Indo-Europeans, and joint author of The Archaeology of Ulster, Excavations on Donegore Hill, The Tarim Mummies, and The Oxford Introduction to Proto-Indo-European and the Indo-European World, and The Encyclopedia of Indo-European Culture. The Munster Irish is a project that explores the genetic signatures of the men of the south of Ireland, the relationships that exist between the various Munster surnames, and whether the DNA evidence refutes or confirms the ancient genealogies of Munster. Much has happened since the initial findings of this project were presented 2 years ago, and Finbar and Elizabeth will be giving us a first glimpse of how SNP-testing has introduced a whole new interpretation of the genetic legacy of the Men of Munster. Administrator of several DNA projects - the O Mahony yDNA project, and the Moriarty and Hartnett yDNA projects; Co-administrator of the Munster Irish project. Group Administrator of The O'Donoghue Society Y-DNA Project since April 2005, founder of the Munster Irish DNA Project with Nigel McCarthy and Finbar O Mahony in Jan 2012, contributor to the Kerry Archaeological and Historical Society Kerry Magazine and Journal and The O'Donoghue Society Journal, and occasional wolfhound breeder. High throughput sequencing technologies have rescued the field of ancient DNA from the cul de sac of haplotype typology and, in the main, from the problem of contamination. The challenges now are in taking the steps towards efficient and affordable whole genome coverage, particularly as sampling is destructive and may not be repeatable. Data from human aDNA projects will be discussed. Particularly, bone choice and subsampling of specific bones are key, imputation may also be used to bootstrap up lower coverage genomes for genotypes that can be used in the most sensitive analyses of relationship. European aDNA informs on the genetic changes that may be associated with the archaeological transitions through prehistory. Professor of Population Genetics, TCD. Member of the International Society of Animal Genetics, & the Royal Irish Academy. Five times juror in the European Contest for Young Scientists. Fellow of Trinity College Dublin. Personal Chair in the Smurfit Institute of Genetics, Trinity College Dublin, and has written or co-authored over 110 publications including in premier journals (e.g. Science, PNAS, Nature). Of particular relevance to Irish genetic genealogy is his research related to Niall of the Nine Hostages. Debbie is an avid genealogist who has been researching her family tree for over a decade. She has written two books for the History Press: DNA and Social Networking (2011) and The Surnames Handbook (2012). Debbie is an Honorary Research Associate in the Department of Genetics, Evolution and Environment at University College London. She is a member of ISOGG and the co-founder of the ISOGG Wiki. She runs the Cruwys/Cruse/Cruise one-name study through the Guild of One-Name Studies, and is the administrator of the associated surname project at Family Tree DNA. She is also the administrator of the Devon DNA Project and the mtDNA Haplogroup U4 Project. She writes the popular Cruwys News blog. You have taken your Y-DNA test – probably a 37 or 67 marker test – and you have a long list of numbers and a list of matches, only some of whom have the same name as you ... So where do you go from here? The first of two linked talks on making the most of Y-DNA test results will look at questions often asked by new testers, such as: Are my matches really my unknown relatives? What can I gain from joining projects? How to make sense of those numbers in my marker results? Should I upgrade my test results? We will run through the different types of group projects (including Surname, Haplogroup, Geographical and Heritage Projects) and see how sharing results through them can increase the value of taking a DNA test. We will also look at identifying signature markers, and what to do about the NPE, when apparent matches do not share a common surname. Lastly we will look at some useful utilities and resources that can help you build your genetic tree and create your own DNA-Surname project. John is a lecturer and teaches at a university in Edinburgh. He is a member of ISOGG (International Society of Genetic Genealogy) in Scotland, and is involved in a project researching the fate of Scottish prisoners captured by Cromwell in the Civil War and transported to the Americas, using DNA and genealogy, working with the Prisoners' descendants. This lecture will give an overview of the Maine Irish Heritage Center (MIHC) and explain how to run a successful autosomal DNA project (as opposed to a Y-DNA project) using the DNA project at the Center as an example. The MIHC has been using Family Finder tests to successfully reconnect broken family links due to emigration, and actively tests people in Ireland as well as in the United States but this model can work for any population. Deborah Sullivan Gellerson is a Board Member of the Maine Irish Heritage Center, a genealogist from Portland, Maine, an Irish citizen via her mom, and an organizer and volunteer for many local organizations. Margaret Feeney LaCombe is a genealogist who has been researching her own family roots and the Irish of Maine for over 15 years, and started the Center's DNA project along with Maureen Coyne Norris, and created and maintains the Center's genealogy database with help from the Center's other genealogists like Deb Gellerson, author Matthew Barker, Krista Heatley Ozyazgan, Maureen Coyne Norris and Patricia McBride Flood. Maureen Coyne Norris is one of the founders of the Maine Irish Heritage Center and our liaison to Centers in Ireland and the US. Medieval Irish historiography bristles with words such as clan, sept, dynasty, lineage and tribe but although some of these have been investigated over the years by scholars, many have been left undefined and their relationship to the Irish words used to describe the structures of their own society - words like cenal, ciniud, fine, sliocht and tuath - are often never clarified. This paper looks at the discussion to date of these terms by Irish historians and compares the data to some of the Scottish clan structures in the medieval period. A particular focus is on landholding which is a huge and difficult topic and one which is almost entirely unexplored; how much land did these various types of units control and what political structures did they use to do so? Runs the Irish Studies teaching programme in Mary Immaculate College, University of Limerick. Mphil. in Archaeology at the University of Durham; a second Mphil. In Old-Irish Language and Culture from Trinity College Dublin. Her Dphil. at Oxford examined the history of the cult of St Patrick. She has taught in many universities, served ten years as organising Secretary of the Irish Conference of Mediaevalists, and runs summer schools in Old Irish in Limerick when she's not off gallivanting across Europe with her pilgrim staff, knapsack and tent. The Irish DNA Atlas is a genetic study of the Irish population. The aim of the project is to describe patterns in Irish DNA, in the context of European and global genetic diversity. This work can inform on the history of the Irish population, as well as aid in efforts to better understand the role of DNA in disease. The project is being run as a collaboration between the Royal College of Surgeons in Ireland and the Irish Genealogical Society. Edmund Gilbert will update the audience on how recruitment to the study is progressing, and the latest results to emerge from the project. Edmund is a PhD student currently studying Irish population genetics at the Royal College of Surgeons in Ireland. He completed his undergraduate Msci degree at the University of Nottingham in the UK, working on human salivary amylase copy number variation. Edmund is interested in human population genetics, how groups vary and the features of different populations. He's enjoying working on the Irish DNA Atlas, a project that is already producing interesting results, and enjoys the connection to the 'human element' that the Atlas has through the genealogical data. NGS (next-generation sequencing) tests like Big Y and Y Elite have transformed genetic genealogy since hitting the market in 2013, but many genetic genealogists remain unsure how to use them, or how to react to the ‘SNP tsunami’. Many think SNP testing is more about prehistoric or pre-surname research, not directly useful to their own research. This talk will show how NGS testing has become central to genetic genealogy, and cut though some of its jargon. NGS testing has uncovered the structure of a newly discovered subgroup in haplogroup R1a (YP355) which was unknown until early 2014, but is now known to be linked to Irish and Scandinavian surnames. The strength of NGS testing lies in how it fuses Surname and Haplogroup research into one, extending the power of DNA testing to reach beyond conventional genealogy, opening up new ways to recount the history of peoples, communities and their migrations across the planet. Gerard will update the audience on recent developments in Irish genealogy, particularly in relation to DNA and genetic genealogy. Topics will include the latest developments regarding the National Diaspora Centre, Big Data, Government Policy, and the latest scientific research. Gerard is a Genetic Genealogy Evangelist and has tested with all of the major commercial DNA companies. He has liasied closely with government officials and has lobbied for greater prominence of genetic genealogy in government plans for the advancement of Irish genealogy. DNA testing is an important tool for anyone researching their family history but the jargon and science can be confusing for beginners. This talk will give beginners a basic explanation of DNA, how we inherit it from our parents, and introduce the three main DNA tests. It will explain the differences between the 3 tests and how each can help your research. Linda is a professional genealogist specialising in Scottish family history research especially for those whose ancestors came from Glasgow and the west of Scotland. She has been exploring DNA for her own family history and feels strongly that beginners need basic information about DNA itself in order to make best use of the test options. Founded in 2005, the Clan Irwin Surname DNA project now has nearly 400 participants. What was traditinally a single-origin Scottish surname turns out to have 30 genetic families unrelated during the surname era. Some of these families are Scottish without Irish connections, some Irish without Scottish connections, but most include Scots-Irish who originated in the Scottish Borders. One of these genetic families has over 250 participants, of whom 12 have BigY test results. The scale of this predominantly Scots-Irish project offers fresh insights into popular understandings of what y-DNA tests can and can't tell us about surname origins and spellings. James Irvine has been an amateur genealogist since the 1950s. Brought up in Ulster amongst his maternal Scots-Irish cousins, he later found his paternal ancestors were from Orkney, reputedly descended from the Scottish Borders family of Irving. Since retiring from a career in the shipping industry in 2000 he has written, edited and published several books including Trace Your Orkney Ancestors, and founded and administered the Clan Irwin Surname DNA project. It may have something to do with current Zeitgeist (one thinks of the Wolf of Wall Street - a good Scandinavian moniker!) but Viking ancestry is very popular throughout the Anglophone world including Ireland. The Department of Genetics in TCD published an important paper on the Vikings of Ireland back in 2006 but with the avalanche of new data available, the time is ripe to revisit their conclusions. Their methodology was to look at surnames showing Norse language elements; we are now more aware that many Norse words and names were absorbed into the Irish language and used therefore by pre-existing Irish inhabitants. Similarly, archaeologists and historians are now much keener than they were to stress Norse settlement in rural lreland, particularly in the north and west instead of simply around the Scandinavian urban enclaves on the coast. This paper examines the conclusions of the TCD paper in the light of new archaeological surveys and excavations, new studies in Scandinavian and Irish linguistics and onomastics , new information on the DNA of animals associated with Viking settlement and, of course, recent SNP developments. It shocked Irish archaeology (or at least the medievalists amongst them) to the core when the TCD study suggested Ireland had almost no Vikings; the native Irish had simply adopted Viking art and technologies. In 2015, is this conclusion still valid? I've got my autosomal DNA results - now what do I do? An autosomal DNA test gives you matches with your genetic cousins on all your ancestral lines and has the potential to help you go beyond the paper trail and to break through brick walls. As the databases grow we will see more and more success stories. Debbie will explain how to get the best out of your test results. What do those ethnicity percentages really mean? How do you know which matches are valid? What is triangulation? And what tools and resources are available to help you? Wales is the closest part of mainland Britain to Ireland, so migration across the Irish Sea to Wales in both directions has occurred throughout recorded history. Welsh family history is unique, but in some respects has parallels to Irish family history. These unique features of Welsh family history will be reviewed. The migration of Anglo-Norman families into Ireland and then later waves of migration via plantation settlements has given rise to a whole range of surnames in Ireland whose origins are now being investigated by the combination of careful Y-DNA analysis and family reconstructions. Brian Swann worked in the pharmaceutical industry most of his working life (1971-2011) and began family history in 1967. He is a founder member of the Norfolk, Dyfed and West Surrey Family History Societies, a member of the Society of Genealogists since 1972 and a member of ISOGG since 2006. In 2009 he was instrumental in helping persuade FTDNA to sponsor a vastly enlarged DNA Area at Who Do You Think You Are at London, Olympia, which has contributed to the growth in awareness of the power of combining DNA and documentary research in the 21st century. His wife is Welsh, and he has a long-standing interest in the history of Wales, with special affinities to Glamorganshire and West Wales. The SNP tsunami has landed us with a huge array of new DNA markers and as we learn where to place them on the evolutionary tree, we move closer and closer to modern times. Soon we will be able to connect the human evolutionary Y-haplotree with actual genealogies that bring us up to the present day. This presentation looks at how it has been possible to construct a combined Family / Mutation History Tree from STR markers, SNP markers, and actual genealogies. This general approach can be utilised and adapted by anyone running a surname project. The growth of genetic genealogy has been rapid but exciting new possibilities are forecast from several major developments: 1) continued expansion of the number of markers commercially feasible to test; 2) sampling coverage to approach 100% of the genetic lineages of Ireland and the British Isles; 3) growth of reference databases with phased results and related tools. These elements in combination will one day allow an individual's raw test results to be linked to an established genetic lineage and its ancestral geography in a matter of moments. This study is intended for those interested in science, technology, and how genetic genealogy will develop as a field.